The governor of Texas declared a state of emergency in 2 dozen counties, as more severe weather conditions are in store for the region, where storms have already killed at least 3 people. Across the border in Mexico, 13 people were killed by a tornado. 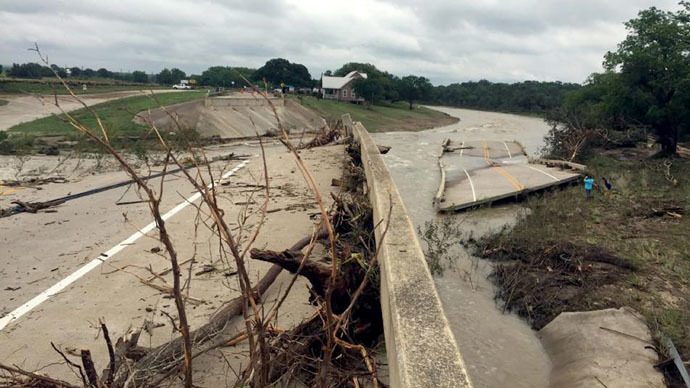 Governor Greg Abbott declared a state of disaster in 24 counties, citing deadly weather conditions that have been tormenting the state since early May. The first emergency proclamation, issued on May 11, had to be amended to include more counties. Houston, the nation's fourth most-populous city, has seen parts of the city covered in water. An unidentified man was found drowned in Texas, while at least two more victims reportedly died in Oklahoma. One woman died after her car hydroplaned and a firefighter was killed when he was swept into a storm drain, CNN reported. Twelve people were reported missing after hundreds of homes were damaged by flash-flooding in Central Texas on Monday, AP reported. The region has been badly affected by tornadoes, heavy rains and thunderstorms as of late. People have been evacuated from their homes, sometimes being rescued from their roofs, Reuters reported. Thousands have been left without electricity, and flash flooding has damaged hundreds of houses and washed away bridges. The area has been suffering from record-setting rains since the beginning of May, and has already received six times more rainfall than typical for an entire month, Accuweather said. More severe thunderstorm and flash-flood warnings, as well as tornado watches, were issued by the Weather Service on Monday, with the governor’s office saying the severe weather could continue through the week. Meanwhile at least 13 people have died as a result of the severe weather conditions in the Mexican city of Ciudad Acuna across the border from Del Rio, Texas, Coahuila state spokeswoman Rosario Cano announced. At least another 230 people were injured in a tornado. Shelters were being set up, after the twister touched down in the region shortly after daybreak on Monday, destroying some 750 homes as well as cars. It is believed to be the strongest tornado to ravage Mexico in at least 15 years, registering from grade EF2 to EF3 on the Enhanced Fujita Scale, a spokesman for the National Meteorological Service told Reuters.